This week, reports and bizarre images of a group of five mummy-like bodies from Peru that have three-fingered hands led to claims by some that the mummies are not human … and may be aliens. Clearly, they aren’t aliens. But even so, what gives? Are they even real mummies? Live Science has found that some of these mummies may represent a combination of the looting and manipulation of real human mummy parts. Grotesquely, the hands and feet seen on this mummy, and possibly the others, may also be parts of real human mummies that have been manipulated by forgers, the white coating added afterward to hide the manipulations, said Nelson, who is not involved with research on the mummies. One of the researchers who signed the statement told Live Science that “I particularly find repulsive that anyone would [dare] to dehumanize deceased human bodies. You can’t take away the condition of human to a human being!” said Guido Lombardi a professor of forensic sciences at Universidad Peruana Cayetano Heredia. According to Jose Jaime Maussan Flota, who is a journalist working with researchers studying these mummies, members of the team pay Mario an undisclosed sum to view the mummies, take samples of them and conduct X-rays and CT scans on them. The mummies were supposedly discovered in 2015 by tomb robbers working in the Nazca region, an area where the ancient Nazca culture flourished. The mummies come from “a group of ‘huaqueros,’ or archaeological treasure hunters, from the city of Palpa,” said Thierry Jamin, president of the Inkari-Cusco institute. Jamin is involved with research on the mummies and refers to the head of this looting group as Mario. “Mario is a treasure hunter. He is a delinquent, who is well known to the police services of the Nazca region. It [his group] has looted archaeological sites on the Peruvian coast for more than 20 years. And justice does not do much to stop him,” Jamin said, claiming that he informed Peru’s Ministry of Culture about Mario’s activities, but has not heard back from the ministry. Officials from the Ministry of Culture did not return requests for comment from Live Science. Videos showing investigations of the mummies have appeared on the sites gaia.com and the-alien-project.com. The lead researcher for the group studying the mummies, a man named Konstantin Korotkov, gave an interview recently in Russian for the Russian Mir 24 TV station. The news site RT (formerly Russia Today) claims that Korotkov said that the mummies have 23 pairs of chromosomes (like a human), but their anatomy looks non-human. “They [the mummies] could be extraterrestrials or bio robots,” RT quotes Korotkov as saying. 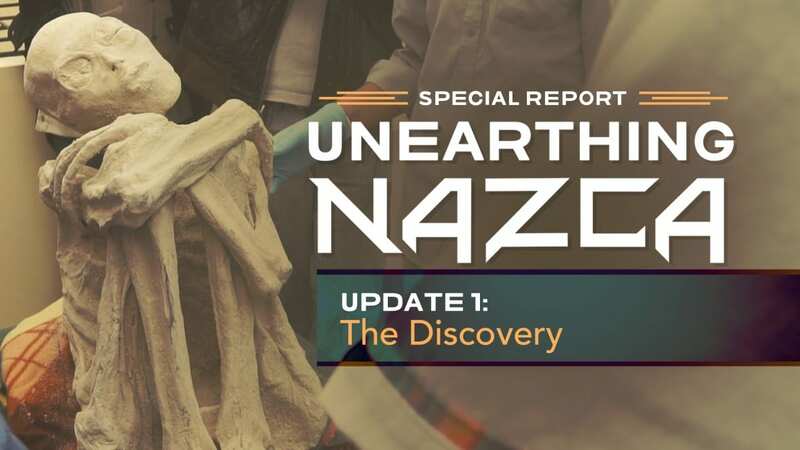 In a video on gaia.com, Korotkov claims that radiocarbon-dating results show that one of the mummies (the same one that Nelson says looks like it was made with parts from a Nazca mummy) dates back around 1,700 years, a time when the Nazca culture was flourishing. Korotkov did not reply to requests for comment and the university gaia.com claims he is affiliated with (St. Petersburg University in Russia) shows no record of him online. Officials at the university did not reply to requests for comment. Another affiliation given in the media for Korotkov — the National Research University in St. Petersburg — doesn’t seem to exist. The National Research University Higher School of Economics has a campus in St. Petersburg — but again no mention of Korotkov on that university’s website and officials with the university did not return requests for comment. Korotkov’s personal website sells a product called Bio-Well that he claims can detect “human light.” He makes no mention on his website of being a professor at St. Petersburg University in Russia or a National Research University in St. Petersburg. While the three-fingered mummies clearly seem to be fakes of some kind, scientists have discovered numerous mummified remains in Peru, including 171 mummies from tombs excavated near the site of Tenahaha, which date back around 1,200 years. While some mummies in Peru have been discovered by scientists, others, such as the ones that may have been used to create these “aliens,” are stolen by looters, who are known to ransack ancient Peruvian tombs before archaeologists are able to scientifically excavate them. The United States has restricted the import of artifacts from Peru in an attempt to stem the tide of looting. While Mario and his gang may still be pillaging tombs, the situation has been improving, said Ann Peters, a consulting scholar at the University of Pennsylvania Museum of Archaeology and Anthropology.